Cook the chicken, either by baking or boiling it, and cut it into cubes. Combine the cream cheese, onion, milk, 1 tablespoon of butter, and seasoned salt and mix well. Add the chicken and shredded cheese and mix until chicken is well coated. Add pepper to taste. Prepare the crescent rolls to make four squares. 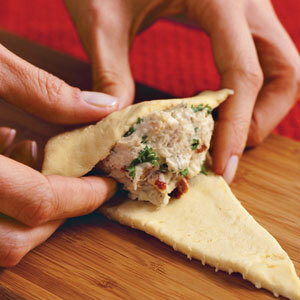 Fill each square with the chicken-cheese mixture. Bring all four corners together over chicken-cheese mixture and pinch until closed. Melt the remaining 2 tablespoons of butter and spread over the crescents rolls. Sprinkle with paprika.